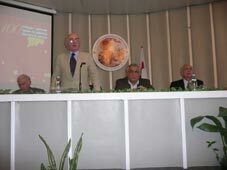 Georgia’s Academy of Sciences and Irakli Abashidze Georgian Encyclopedia have prepared and published a book “100 Georgians Abroad” in Georgian, English and Russian languages. This book accumulates the biographies of the people with Georgian origin who lived and worked abroad and who played serious role in cultural, economical or political life of those countries. These were Georgian origin persons who lived in Egypt, Byzantium, Greece, Palestine, Iran, Turkey, Russia, USA and Europe and other places. Among those mentioned are Daud Pasha Gurji the last mameluk leader of Iraq, Mimanguli Khan – commander in chief of the Iran army, Bulat Okujava a poet living in Russia, George Balanchine, founder of American Ballet and many others. The editorial board consisted of professors Mariam Lortkipanidze, Roin Metreveli, Valeri Silogava, Gocha Japaridze, Zurab Abashidze and Giorgi Lortkipanidze. As it was announced during the presentation of the book the list of the Georgians living abroad will grow and grow with more names and more material as time goes on. The editorial staff was: Irina Abashidze, Tamar Dolodze, Marine Tushishvili. The book was designed by Giorgi Tsereteli.